Backed by their influential leader and director of athletics, Dr. Brian Wickstrom, Southland Conference’s heavy hitter, University of Incarnate Word, has just knocked a home run with the installation of KONGiQ and Vivature Software. KONGiQ is the newest and most cutting-edge software available. KONGiQ uses bio-metrics, robotic tilt cameras and laser technology all working within a single database to provide the most accurate results on the market today (click HERE to see KONGiQ in action!) The cutting-edge technology is capable of measuring and recording an athlete’s strength, performance, velocity, force and distance, and individual measurements accurately within seconds. This streamlines the workload of coaches and provides them with information they have never seen before. High Schools are signing up for this software and are allowing the colleges to see the information on their athletes as a new recruiting tool. This makes gathering data on a prospective athlete easier and more reliable than it has ever been before. Located in sunny San Antonio, Texas, just steps from the famous Alamo and popular Riverwalk, the University of The Incarnate Word is a top Division l school in the Southland Conference. From its high-performing football team to their passionately competitive fencing program, the entire student-athletic body is on board and thrilled with the new and cool technology installed on their campus; all provided by Vivature. 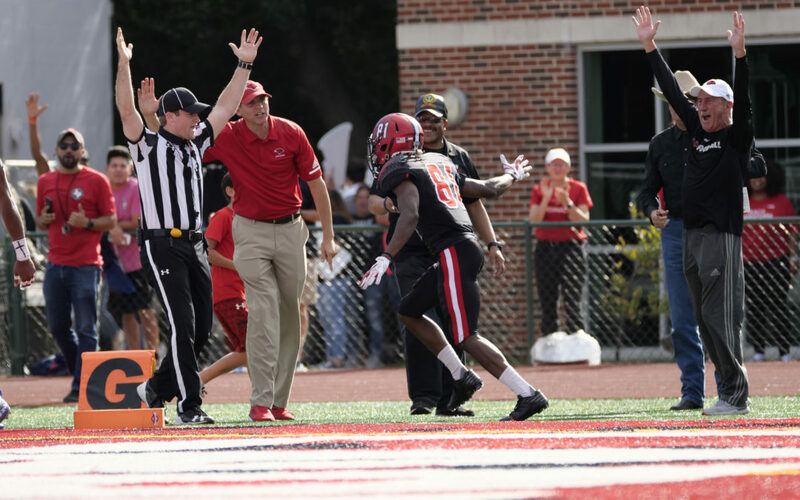 University of the Incarnate Word’s director of athletics, Dr. Brian Wickstrom has been the man in charge of their Athletics for just 19 months and already energized the department and increased major exposure of the university to the community. It’s even more impressive to note that since his career started approximately 20 years ago, he is personally responsible for bringing in a whopping $93 million in commitments and has been recognized in articles such as Top Athletic Directors in the Group of Five by SB Nation’s Underdog Dynasty and Top 10 Fundraising AD’s in College Athletics by CollegeAD. Prior to coming to UIW, Brian was the Director of Athletics at University of Louisiana Monroe and holds impressive background stints at UC Riverside, University of Texas El Paso, University of Michigan as well as Santa Clara University. He comes from a background of sports himself, a Track and Field athlete at Kansas State University. He credits his sprint coach, head coach and Athletic Director as sparking his desire to give back to student-athletes. He never lost his athletic heart and love of the sport. He remains passionate about athlete’s healthcare and well-being, and ensures that his trainers and coaches feel the same. He now credits his drive as succeeding as AD, to Mike Alden, Ross Bjork, Mario Moccia as well as Chancellor White of the UC-System and current boss, Dr. Evans. Seeing how he has upgraded the Warhawk’s Training rooms, created 12 new positions and hired 52 new staff members within the Athletics Department, he is staying on top of the highest technology and healthcare available for his student-athletes. His sheer determination to reach his lifelong goals definitely shows. measurements and performance results – fed by biometric and 3D skeletal cameras in real time – to help inform coaches, trainers and administrators via more accurate and timely data. The data KONGiQ collects will change the way you look at your program and your athletes. Give coaches accurate real-time performance readings to maximize their athletes’ potential. Drive Competition! Motivate athletes to not only compete against themselves, but amongst their team, with pre-determined metrics set by the coach to ensure athletes are performing at the desired intensity by tracking Velocity, Force, Power and Effort. 3D Skeletal Cameras! Each rack can be equipped with a robotic tilt motor to track the movement of 25 different body joints. Instant Rsults! Generate real-time workout reports to monitor the progression, and instantly view video footage of performed lift while creating a more efficient and safer weight room. Put Down the Pen and Paper! KONGiQ’ s online database eliminates the time-consuming manual data collection by replacing it with supremely accurate, instant record-keeping; all part of the best velocity-based training program available. Works in a Fast-Paced Team Setting – The cameras are designed to not be distracted by background movement and can work in a fast-paced workout environment with hundreds of athletes working out at the same time. A true win for athletic departments. web-based database to track and monitor injuries and medical treatment, strength and conditioning, psychological and nutritional health, as well as academics. Vivature is a Dallas, Texas based firm was recently named one of the “Top 25 Emerging Sports Technology Firms” in the country, and now has more than 400 collegiate partners. Vivature uses a $20+ million enterprise-level single database, and their VIVAiQ (formerly known as “NExTT”) software to make college and university sports medicine departments compliant with all federal and state medical regulations by properly recording student-athlete injuries and treatments being conducted as required by law, as well as providing the NExTT 360 solution by recording and improving student-athlete care in the areas of Nutrition, Counseling, Academic Counseling and Strength & Conditioning (KONGiQ).